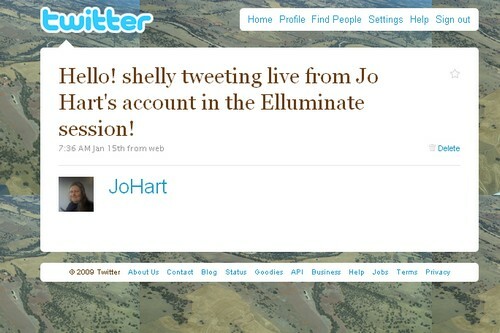 January | 2010 | E-verything! This week’s recorded Edublogs Webinar was presented by guest speaker Sue Wyatt aka tasteach. Sue describes herself as “a nearly retired teacher bringing the world of web 2.0 into her classroom”. It would be fair to say that through her Blogging Challenge she has brought the world of web 2.0 into many classrooms around the world! The challenge began with about 500 students from 8 countries and has now developed to over 3000 students from 15 countries. Beginner bloggers, veteran bloggers, commenters and classes take part. Each week a new activity is posted and teachers may use as they wish in their classroom and hopefully link back to the original post. As usual we had global participation and as usual this and the great subject gave rise to a lively session with a very “busy” text chat throughout as well as the polls and whiteboard interaction. Sue told us how she started blogging herself and then very soon progressed to blogging with her students, and then how the whole challenge went global with the invaluable help and support of Sue Waters. In the next part of the session Sue took us on a Web Tour giving us a look at a variety of blogs that have been part of the challenge over the last two years and showing how the Challenge as developed and grown to encompass so many participants. 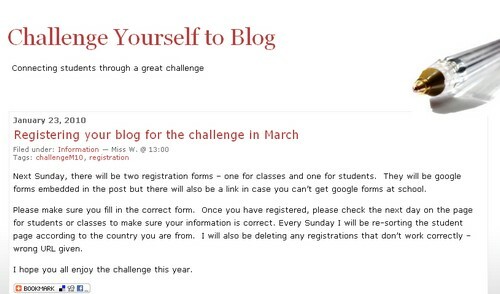 Finally Sue gave us a “heads up” on the Challenge due to start in early March – registration forms will be available for you to register your class and/or individual students from tomorrow (Sunday 31st January 2010) on “Challenge Yourself to Blog”. In preparation for the new Challenge Sue Waters is writing a series of posts (the first is on creating a class blog) on the activities that are useful to do in advance tof taking part in the Challenge. As usual these are full of excellent advice and are a great read whether you plan to take part in the Challenge or not. Thursday February 4th at 23:00 GMT (6pm USA EST, Midnight CET) or Friday February 5th at 7am West Aus, 10am NSW. Join us here in Elluminate as usual – look forward to “seeing” you! This was a very lively global session – I think in part because we had limited time for each topic and I set the timer to keep us on track, this seems to be a really good way of focussing our minds on the topic of the moment. So we started with the topic of “Ideas for teachers new to teaching in a 1:1 environment As always, discussion was multichanneled using the whiteboard and text chat as well as audio. People shared their own experiences and the were also a number of links shared via text chat including several on internet safety – checkout the recording to get the full flavour! The second topic “Focus on typing instead of handwriting in elementary school” is particularly interesting for me as I have terrible brain to pen co-ordination, almost illegible handwriting and the physical act of writing stops me from thinking. With a keyboard I can think and write enabling me to produce much better quality writing. The topic arose from a concern that there is too much emphasis on handwriting at elementary level at the expense of learning typing skills and that good typing skills are becoming more and more essential. This discussion also included the sharing of several links to touch typing programs. I also have links to typing programs and as promised here are a couple that I use with students. Because I work in an adolescent and adult environment I do not have to vet as carefully for the type of advertising on the site as I would with yong children so please be aware of this when you are looking at these sites – the BBC one has no advertising but the other one does. I usually provide a list of several typing tutors for students to choose from. To finish off the session we had some feedback to help us in the future and also asked for topics of interest that we might address in future sessions. Give ‘em a piece of the action! The second of two related posts about using Application Share (App Share) in Elluminate sessions. The reason for this post is to cover some of the “nuts and bolts” and briefly touch on some of my personal strategies in using Application Share. These were not covered in detail during the Elluminate session “Share and Share Alike” or the related post. If you have been in Elluminate sessions you have probably experienced Application Share. It is often used by presenters to show a website or application to participants and sometimes is used as the basis of an entire presentation. In my personal opinion using a WebTour is more effective for websites, however it is not possible to WebTour if you want to show a password protected site. Many people use App Share very effectively to show sites or applications but this can be a bit “teacher centred” and occasionally can turn into something similar to “death by powerpoint”. It is also very easy to fall into the trap of using App Share to show participants a document you want them to read. My advice would be “don’t do it!” Every time you scroll the screen will be refreshed for all participants – it will take different lengths of time to refresh for each participant. Some will be impatient because they have finished what is visible, some will be frustrated because they are never able to read any of it before the next refresh. File Transfer is much more effective – participants can then read at their own pace. There are also alternatives if you must put up one copy for all to see. Either take the time to pre-prepare by using the editable text tool on the whiteboard to create a series of whiteboard sized “chunks” to be displayed successively, or take App Share “snapshots” and place on whiteboards. 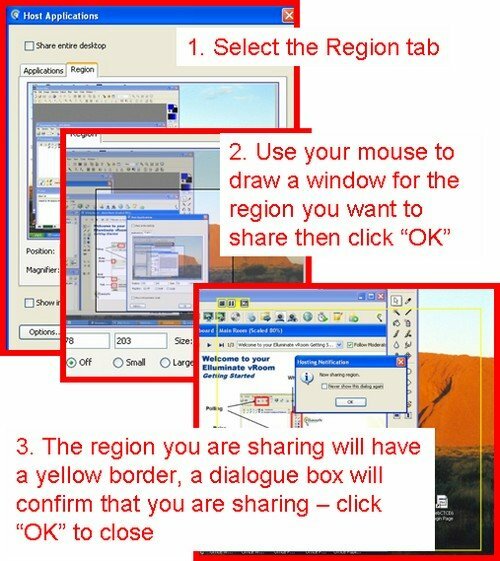 This last can also be useful to substitute for direct sharing if you have participants with slow updating. 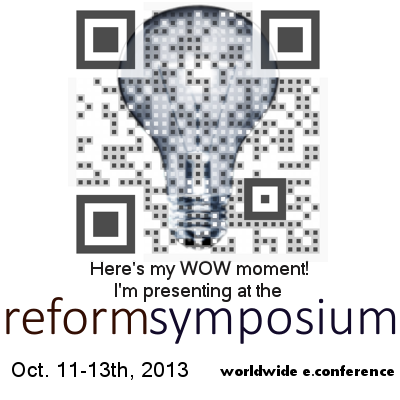 I use App Share myself occasionaly for a very quick, “off the cuff” show and tell. However I use it mostly to share applications interactively ie to enable participants to work with the content directly on my desktop by giving individuals control of my desktop. Secondarily I use it to troubleshoot problems for remote students by requesting control of their desktop. There are several alternatives for sharing your desktop in Elluminate. It is possible to share your entire desktop. This is something I do extremely rarely as there are some risks in relation to privacy. You can also share specific applications – the app you plan to share must be open before you begin the share. Also if you have two screens make sure that it is “seen” by Elluminate. The sharing that I use most frequently is to share a region of my desktop. This is a personal preference and I find it easier all round as I can set aside a piece of screen and just move applications or anything else I want to share into that space. Sharing a region is fairly straightforward. I like to keep sessions as interactive as possible – it is all too easy for people to “switch” off in a virtual room & I don’t see their body language to tell me they are bored. Giving control to a specific individual enables me to ensure “taking turns” this is often an issue for me in face-to-face situations because many of my students are Youth at Risk and they often lack social interaction skills and will “talk over” their peers or teacher. If I give control to an individual this enables me to see that they are able to use specific tools in an application – in my context where assessment is often observational and/or evidence based it gives greater validity. It’s a good idea to leave your microphone on throughout (unless you have someone else needing to speak). Although you can control the mic with Ctrl+F2 this may “jump” Elluminate to the front so that it covers the shared region – this occasionally happens to me even when I have resized my Elluminate screen to avoid covering the shared region. I feel it is really important that students have the opportunity to practise remote control of my desktop and that this is done in a friendly and supportive group context. For the initial tryout and practise I use icebreaker type games, at first with a simple task untimed. As the participants become more confident and competent at dealing with the inevitable lag in response when working remotely I sometimes time them in completing the task. However the great thing with Elluminate is that if someone is really struggling we can always blame the technology and thus avoid damage to self esteem. Coaching an individual through a new task/activity while the rest of the group watches as a demo, or having another participant coach someone through a task/activity. These are just a few of the possibilities for interactivity with App Share in an Elluminate room. As usual I have written far too much, so it’s definitely time to stop. Hope you have fun giving participants “a piece of the action”. 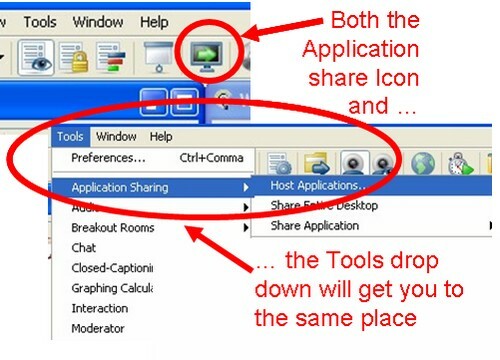 The first of two related posts about using Application Share (App Share) in Elluminate sessions. This post is about our recorded Edublogs webinar this week which focussed on avoiding “death by Application Share presentation” in Elluminate sessions. In other words it was about using App Share in a way that allows interactivity rather than just as something for participants to watch. The second post will be about the mechanics of App Share and some of the strategies I use. As usual we had global participation although this week there were more Australians in the session – probably due to Steve Hargadon’s initiative regarding the Australia Series on LearnCentral and the fact that we are trying to be organised enough to put sessions on the Australia Series events calendar in LearnCentral and on the Events Calendar in The Educator’s PLN Ning as well as in the usual place on the Edublogs Live Events Calendar at the bottom of the Live Events page. The session was great fun! Everyone was lively and vocal (both on audio and in text chat) and also very willing to experiment – this always makes for excellent sessions with lots of ideas exchanged. We started with a look at where everyone was coming from with respect to Application Share. Followed by a look at the AppShare menu to indicate which items we were going to explore – this included giving and taking control of remote desktops and a quick overview of the different ways of sharing applications on Elluminate. We spent a little time on the pros and cons of the different options for sharing and also on some of the possible issues that can arise. Then it was playtime! My absolute favourite part of all these sessions is the time when we try out features of Elluminate that make it a great tool for interactivity. We did this mainly through sharing my desktop in different ways and giving everyone an opportunity to take control of my desktop and work on it remotely. The first opportunity was an icebreaker game that I use to give people practise at using a mouse on a remote desktop, and the second was for people to use my desktop to Tweet live from my Twitter account on my desktop. Everyone did brilliantly – the first time you work on someone else’s desktop it is always a bit difficult because there is an inevitable lag. However this posed few problems for the group as they demonstrated their great remote control skills!. As the person whose desktop is being remote controlled you have to keep your hand well away from the mouse or you end up fighting for control – this can lead to much hilarity but can also be very frustrating for the remote controller who is being hijacked. 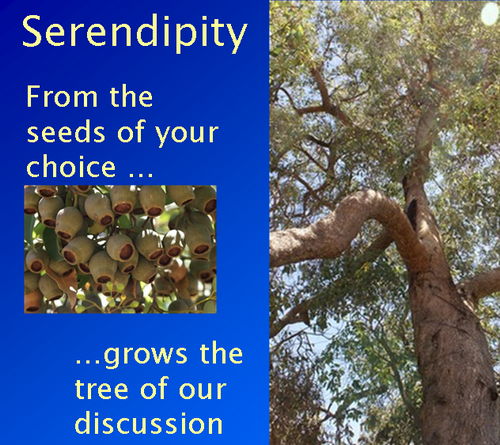 Next week we have an Edublogs Serendipity – unconference session so bring along your hot topics and burning issues and throw them into the melting pot for the poll to choose our topic in the first ten minutes. Getting the Admins on Board! We have “smartened up” the Serendipity whiteboards so hopefully they look a bit more professional. This has given us a picture we can use to publicise the sessions and let more people know about Serendipity. I was unsure whether we would have any participants as this was the first session after the holiday break. However my fears were totally unfounded we had a global presence including people from across the United States, Australia and Europe. This always makes for great sessions and often raises as many new questions as we come up with ideas. Particularly interesting for me is the global variation in what people in superficially similar roles do as part of that role. We had a variety of ideas for encouraging admins to embrace the technology on the whiteboard as well as through the lively discussion on audio and in the text chat. These included case studies and examples from participants on what has worked for them in terms of admins buying in to the use of technology/Web2.0. As often, we diverged briefly from the initial topic. This was short foray into issues around the pros and cons of inhouse tools/closed environments vs writing in an open social media environment. This is a topic we may further explore in a future session. The upcoming Edublogs webinar this week is about using the application sharing feature of Elluminate for interactivity. So look forward to seeing you on Thursday January 14th at 23:00 GMT (6pm USA EST, Midnight CET) or Friday January 15th at 7am West Aus, 10am NSW. Here on Elluminate as usual.